There’s a wealth of incredible places to eat on the White Isle, you just need to know where to look! The island’s gastronomy has been on the up over the last five years, thanks to increased tourism from the continent, with everything from fresh sushi to indian curries on offer for in-the-know visitors. For those in the market for contemporary Spanish fare with a British twist, head over to the tiny, secluded village of San Lorenzo where you’ll find local hot-spot, La Paloma. 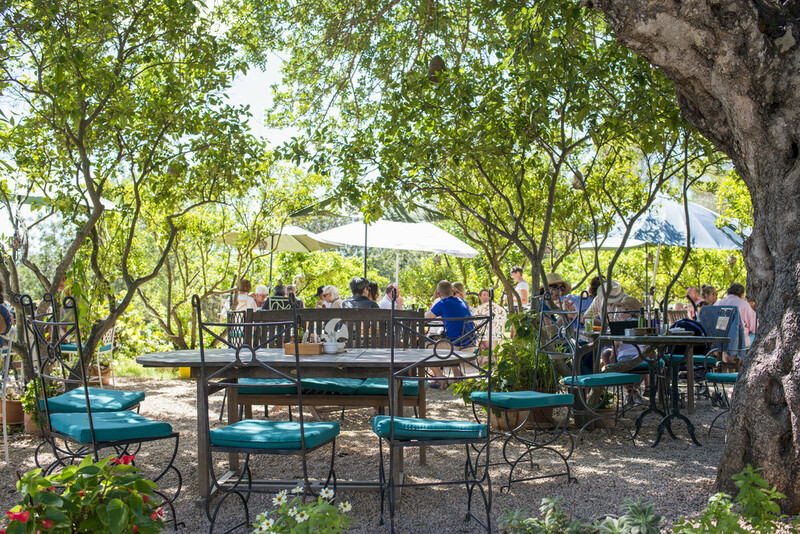 A favourite of Sven Väth and the Cocoon crew, this adorable eatery boasts a stunning candle-lit garden and sweeping views over an orchard — this is about as romantic as it gets! If you’re looking for something closer to San Antonio and the bay, head over to The Olive Tree in San José for dinner and drinks in a relaxed, intimate setting. It’s serving up traditional British dishes throughout the season — think: steak and kidney pie, roast chicken and goats cheese salad. And don’t forget to order the sticky toffee pudding for dessert! Want to treat yourself to something special? Fans of the finer things flock to famous Ibiza spa and resort the Hacienda Na Xamena each year. With its multiple plunge pools that look out over a secluded bay, plus gourmet food and designer spa services, it’s pretty decadent — save this one for special occasions. It’s a big hit with the DJs, too — expect to see everyone from Darius Syrossian to Dubfire at the Hacienda. Plus big names like Solomun, Coxy and pretty much every DJ from Ushuaia within its walls. If you’re not in the mood for sleeping at all, there’s a wealth late night venues on the island — our pick is Tantra at Playa d’en Bossa for a non-stop party experience just a few short minutes stroll from Space. There’s also a sweet radio studio on-site hosting shows from Chris Liebing, the HYTE crew and lots more — you never know who you might bump into! Listen to Ibiza White FM here. 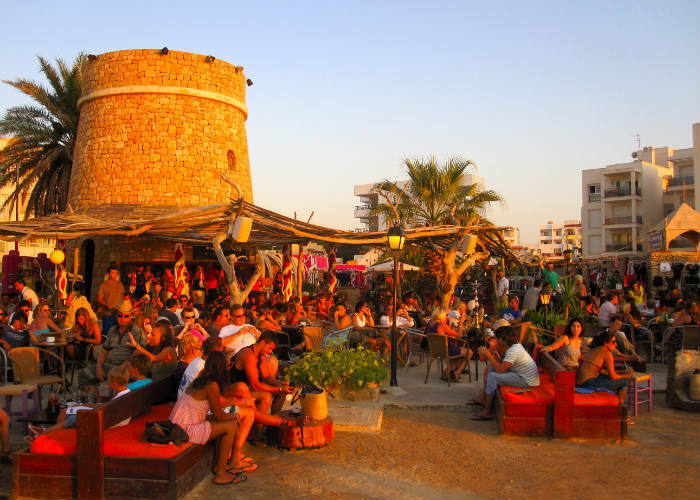 Ibiza is famous for raving and with so many options on the table, it can be hard to know where to start! If you’re a fan of five-star service and a VIP lifestyle, then open-air daytime venue Ushuaïa is for you. There’s a host of big name, commercial DJs manning the decks at the club this season — cue club-nights from Hardwell, Oliver Heldens, Martin Garrix, Steve Aoki and more. If an intimate setting is more your vibe, head over to one of Keep On Dancing’s parties at LIPS Ibiza. Featuring glamorous dancers, decadent set design and the island’s best DJs (Apollonia played all-night-long at their latest party), expect to see Music On’s Marco Carola stopping by for a low-key bev — this is one of the island’s coolest rave-ups. If you’ve woken up and feel a little worse for wear, don’t despair — there’s nothing a spot of yoga can’t fix. San Antonio’s Kumharas hosts regular yoga, pilates, stretching and world dance classes in their beachside, open-air restaurant and bar, kicking off at 10am each day throughout the season. Best bit? You also get a free breakfast with the ticket price, with fresh juices, coffee, teas and toast on offer. If you’re still feeling a little ropey, chillout with some cocktails and seafood while watching the sunset at Mambos in San Antonio — one of the island’s most famous hangouts. If you’re on a budget, catch a taxi up to the south-west of the island to watch the sunset over famous Ibiza landmark, Es Vedra. It’s a rocky island just off the coast of Ibiza and a part of the stunning Cala d’Hort nature reserve. Ask any taxi driver to take you to one of the island’s many vantage points to see it, and make sure you pick up a couple of icey cold brews on the way. Magic!